When you're thinking about what a wedding ceremony looks like, the first thing that comes to mind is generally a beautiful stone church. Maybe even something with beautiful stained glass and big open pews? You can literally picture a bride walking down the center isle with a long flowing veil. Well, if you're in Pittsburgh, St. Bernard Church is the answer to all of your wedding dreams. In this photo we are seeing Stephanie and Matt profess their vows to each other on their wedding day. The officiant had them facing out toward the congregation so they could see the smiling faces of their friends and family during the most important commitment in their lives. In such a grand church like Saint Bernard, a classic black and white photo of the wedding is a no-brainer. 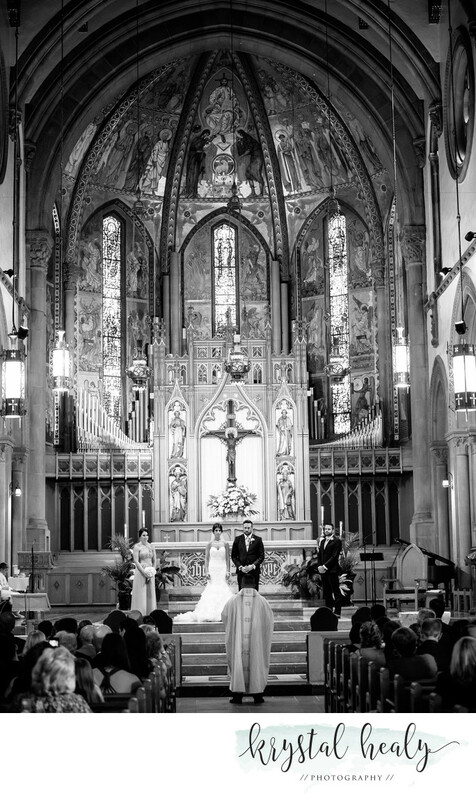 We absolutely adore shooting weddings in this church and hope that you consider us when you book your wedding ceremony at the beautiful St. Bernard's Church in Pittsburgh! Location: 311 Washington Road, Pittsburgh, PA 15216.